BTW, I've noticed a bug (and this time it's in 0.50c as well) - take a look at the attached image: It looks like some pixel lines and columns are missing... or doubled... or just shifted... I can't really tell. Happens every now and then. Looks like there's some scaling going on, and with no interpolation happening, it has to resort to line doubling, or whatever that is. This looks like a great tool! I’ll be sure to check it out. Thanks a lot for sharing. 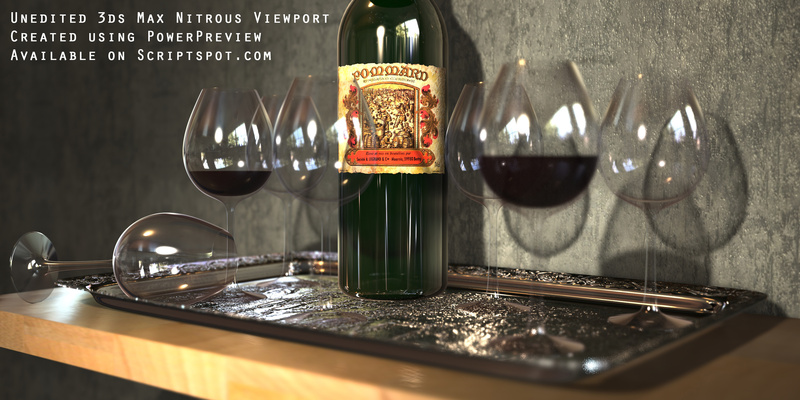 This one supports 3ds Max 2013 and adds some handy features for the new Nitrous goodies, like DOF/Bokeh handling and the improved standard “Make Preview” functionality. Already using it, thanks very much. I finally got some time to play with this script and i have to say it is very useful. One thing i have issue with is getting the aspect ratio to match the viewport. Somehow the latest version (V0.60 Beta 6, I’m still running Max2012) is very fragile for me… it doesn’t crash, but as soon as I switch to another window OR have other windows open (like the curve editor, MatEdit, etc.) OR have something like the “key mode” button (right of the “Key Filters…” button) activated during preview creation, the Max window goes white after a couple of frames and the preview freezes. I can press ESC to quit preview creation and go back to normal though. Still it’s very annoying when you can’t even work in another window (I’m running a dual screen setup) while creating a preview. It doesn’t even bother me anymore that image refinement gets turned off during this, but now switching windows doesn’t work at all anymore! Just wanted to post a quick thanks, Josef! Just tried out Power Preview for the first time this week…amazed at the power of this script! Using it for all previews now. Going to also try and use it for rendering final images for certain projects. Appreciate you putting so much effort into the plugin and releasing it for free. You should add a donate button to the plugin’s page! I already thought about placing some donate button on the dowload page. Maybe such a thing will come midterm. In the meantime i just wanted to inform all PowerPreview users that i started to work on PowerPreview again after some months of inactivity, due to other tight schedules i had to fullfill. it’d be great when I get to a level where I can use Power preview to render out final animations for certain jobs. Quality is already looking great! Will it ever be possible to ‘render’ out render layers - z-depth passes, spec, reflection, etc? Or is that possible already but I just don’t know that?! Really cool tool, something that is in my standard toolbox from now on. I have some requests though. Would it be possible to save the settings with the scene? When i use it now all settings are reset when I close and reopen the window. The tokenizing of the output name would be nice if it would be regathered at the start of the preview process (at least for the time flag), as of now i keep the window open (to keep the settings) and inbetween the previews i don’t really think about declicking and re clicking the timestamp toggle which updates it. This in turn gives all the previews the same name. It would also be cool if you could reset the scale of the output image to 100% easily, OR be able to actually type in the percent text field. For last, the output scale seem to be a little off when using big scales. My render settings are set to a bigger size than my screen (or max viewport) can handle (1920:817), and by that the size is clamped, which is all fine, but the scale still says 100% when the width and height in the power preview window are clamped at (1678:714), and when i set the scale to 50% i would assume that the output from power preview would be 50% of my render settings, but instead it is 50% of the clamped values of my viewport. With no knowledge in how this works, i cannot change which settings to use with the ffdshow setting, (but i can when using the regular animated preview), i want to change settings like fps which for me doesn’t match with the scene, and other encoders. Also, the camera setting doesn’t update with new selection of cameras (if i have the perspective view active when starting up the tool, but then change to a camera view, the camera specific settings don’t activate), not important but would be sweet if it was possible. Again, thanks for a great tool! Thanks for the input Tollman, will try to integrate some things of your suggestions. Just put another update online ( V0.70b - Beta 8) . This version is Max 2014 compatibel and contains some fixes and code restructuring. Also while I’m here, a somewhat relevant question about viewports(please excuse my laziness for not creating a thread for this), I don’t suppose there’s a way to get a matt/shadow/reflection material effect right inside the viewports for the real-time AO/Shadow effects, is there? Thanks for the quick reply and the explanation, about the DoF thing, nevermind, I think it was an issue on my end, thanks again for this tool, it has a permanent place on my main toolbar now.